Review: "Tinyfish: One Night On Fire � Live In Poland (DVD)" - Sea of Tranquility - The Web Destination for Progressive Music! Tinyfish are a modern progressive rock band from south London. The band's beginnings date back quite a few years as an acoustic outfit called Men Are Dead and took the name Tinyfish in 2004 once their music became more complex. The band has one full length album and an E.P. to their credit. 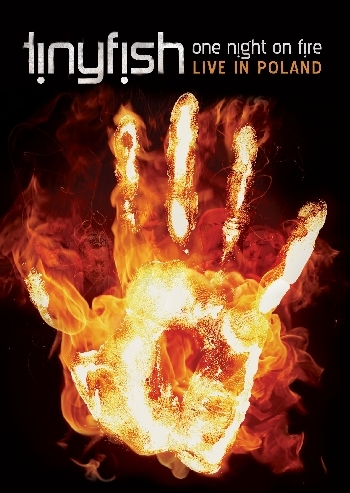 One Night On Fire � Live In Poland is their first DVD. Band members include Paul Worwood (bass guitar), Simon Godfrey (lead vocals, guitar), Leon Camfield (drums, backing vocals), Jim Sanders (guitar, backing vocals) and Robert Ramsay (spoken word). The band's music is hard to describe as they have a sound all their own. On their website they list influences of Rush, Marillion, King Crimson and Tom Waits. I cannot comment on the Waits influence as I have not heard his music but I do hear occasional snippets of those other artists in Tinyfish's unique brand of rock, but this is only a slight similarity. They really do sound like their own band. What you will notice first and foremost is the absence of a keyboard player. Instead, the band uses guitar synths, effects and electronic percussion to generate some interesting soundscapes and the absence of keyboards is not a hindrance to their sound. The music has a lot of dynamics as Tinyfish like to play mellow, dreamy sections to go along with faster rhythms and melodic guitar solos. Godfrey has a good voice and provides mainly rhythm guitar. Lead guitar is provided by Sanders who is an accomplished player. Not flashy by any means but does a nice job in getting the right tones and atmosphere out of his instrument. Mention should also be made of the rhythm section of Worwood and Camfield as they do a great job pushing these songs at the desired pace which often changes within the song. The DVD begins with a touch of theatrics as atmospheric sound effects fill the air followed by the spoken words of Robert Ramsay who appears on occasion, in full costume, relating the story to the Katowice audience who seemed quite receptive throughout the evening. One of the album's best songs is the rocking "The Sarcasm never Stops" where Camfield and Worwood really show their stuff and the guitar work of Sanders really shines. Other highlights include the funky bass and rhythms of "Cinnamon", the compelling "Driving All Night" where slide guitar and spacey instrumentation come together nicely and the hard driving mini suite "All Hands Lost" that sees the band going for an edgier sound with Sanders really cooking up a storm on his guitar. The DVD comes with a few extras including an interview with Godfrey and Ramsay, a short biography of the band and an informative documentary. Metal Mind Productions continues making fine DVDs with One Night On Fire. Accessible yet complex, the music of Tinyfish should please fans of moody and melodic progressive rock. Highly recommended!